I believe that everyone has milestone “oldies” music that stick in their minds forever. Occasionally one might erupt during a vigorous shower, a hike in the forest or even a long walk down Main St (or off a short pier). Aside from the Beatles “I Wanna Hold Your Hand” and “I Saw Her Standing There”, I can just about count on 76 fingers the others (I ate a lot of Monsanto products before going organic vegan) other such songs that packed a powerful punch on my psyche. One of those songs that seemed to “change my life” at the time, was Aqualung. I imagine some of the lesser played numbers on that album such as “Teacher” “With You There To Help Me” and “Locomotive Breath” were also major influences in my own love of music and my motivation to try to learn new songs on my cheap little guitar. I loved playing it but was not very good. I became relatively better later in life, but still, in my mind, not stageworthy….though I did play in some garage bands in my younger days and played a few times in public, both bars and in the park as a more matured adult. By then, I knew to keep my mouth shut, given that my singing voice had not improved much at all since age eight (if any). But my guitar playing became fairly good. In my sometimes complex autistic mind, I often wondered the the musician’s real story behind every song I loved. So many incidences could have been the impetus for Jethro Tull’s “Aqualung”. I became so curious I saw that Ian Anderson had a website and I wrote his email, only to predictably hear nothing back. I wrote several more times before I realized I was going to have to guess the scenario by my own volition. And I knew since I probably wouldn’t get it right, I could probably make it a bit absurd using artistic license. But I’ll let you be the judge of that. 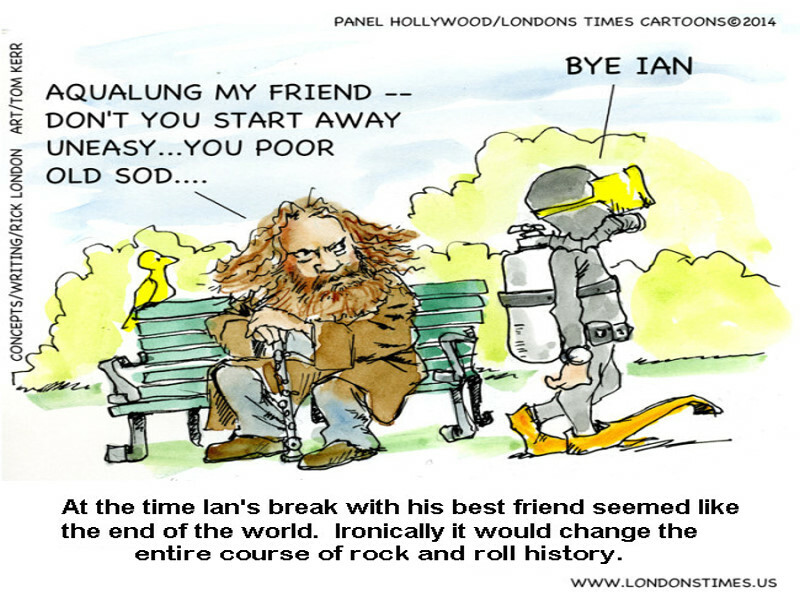 Collectors enjoy our “The Story Behind Jethro Tull “Aqualung” cartoon gifts and collectibles. You can see the entire collection by clicking on “Shop Now” below (though there is no obligation to shop but to simply browse if you like (for as long as you like). There’s a lot of neat items, a little something for everyone; and most of them are quite reasonably priced. Hope you find something interesting; and if not, please share with some friends.